Ross The Boss DJays at Gimme Radio every Tuesday at 3pm EST. Sign up for free and listen to pulverizing Metal 24/7 on the website or download the app to your device. 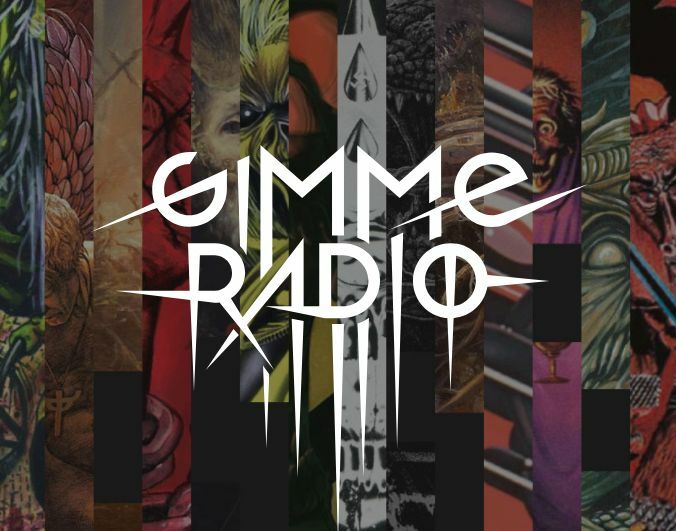 Gimme Radio puts the passion back into the way we listen to Metal on our digital devices by enlisting real Metalheads, Artists, Producers and Metal Journalists to hand pick the songs they play. Ross is excited to be on the roster with DJays like Dave Mustaine, Randy Blythe, and his friend/bandmate/producer Dean Rispler. Listen to his show "From the Cage" Tuesdays at 3pm EST with repeats Wednesdays at 7am EST. As a purveyor of True Metal, Tarek "MS" Maghary, vocalist and creator of the German Heavy Metal Band Majesty, looked up Ross The Boss, in his capacity as one of the founding fathers of True Metal, to do a solo on Majesty's 2004 album "Swords and Sorcery". The two developed an instantaneous friendship. Also the promoter for the Keep it True Festival, Tarek got the brilliant idea to match Ross up with German Manowar Cover Band "Men Of War" for one night of early Manowar Music at Keep it True VI in April 2006. This show marked the first time Ross had played a whole set of Manowar songs in nearly 20 years. They put on an energetic, moving and emotional show that made all the Manowar fans remember how much they loved Ross The Boss. All the guys really enjoyed playing these shows, so he promoted them to be his own backing band. Since Ross never had any intention of "being a tribute to himself", they quickly began collaboration on new original material. The band released two albums on AFM records, played a lot of festivals, and gave Ross the itch to do more collaborations with more Metal musicians. "I guess this return (I can call it that, right?) to metal for Friedman is about as good as it’ll ever get based on his various abilities: his riffs are an excellent concoction of speed and heaviness with enough fast and mid-paced material to please any metalhead, the songs are masterfully written, and his solos are absolutely blazing and fun. The group’s identity is what you’d expect: slaying heavy/power metal. Obviously, the record has an overt Manowar vibe to it, but also a smudge of hard rock influence with all that meaty heaviness; it’s quite an interesting mixture, albeit a great one." In 2016, Ross was asked to play a one-off Manowar-songs set as the surprise guest for Keep It True XIX Festival. This time, he gathered some great musicians from his home town of New York City including bass player Kevin Bolembach, his nephew Lance Barnewold on drums, and singer Mike Cotoia (Fate Breaks Dawn). The set brought down the house, and Ross The Boss was asked to do more shows and festivals. The cycle continued with a different Ross The Boss touring lineup for 2017 including former Manowar drummer Kenny "Rhino" Earl, Mike LePond (Symphony X), and Marc Lopes (Let Us Prey). Together they spent most of the year on “The Discipline of Steel” World Tour , bringing a full set of Manowar classics done Ross-The-Boss-style to as many people in as many cities as they possibly could, including appearances at the first Hall of Heavy Metal Induction Ceremony, and at the 2017 Wacken Festival. "My plans for this year? Gigs, Fests, New Music ... What else?" The band finished recording an album of original material in early 2018 featuring Marc Lopes on vocals, Mike Lepond on bass and Lance Barnewold on drums. The band will be touring all year with touring drummer Steve Bolognese (Into Eternity, Death Dealer), with the album release expected in the spring of 2018. Shakin Street glad to be rocking France hard ! !